We're not going to lie: This office was very much divided on the idea of a second long-term example of America's favorite targa top, the Corvette. After the ordeal we went through with our first C7 Stingray-including but not limited to a new engine-many of us thought a second example wouldn't change our minds on the C7 and would only solidify the opinion that it is a very fun to drive, very capable, but unreliable sports car. Many of us were wrong. The Grand Sport model debuted for 2017, and its combination of Z06 chassis and Stingray powertrain won it a spot on our 10Best Cars list for 2017 (and 2018), after the Stingray fell off the year before. This compelling new variant, and the hope that the C7 might redeem itself, spurred us to order an Admiral Blue Grand Sport for a long-term test. Aside from the $4455 2LT package, which includes heated and ventilated power seats, auto-dimming mirrors, a head-up display, satellite radio, and front-view cameras, our second C7 came with just one other option: General Motors' Performance Data Recorder (a $1795 upgrade). From a 2017 Grand Sport base price of $66,445, the total MSRP rose to just $72,695, representing a fair bit of options restraint. Before we gathered the initial test numbers, we took the Corvette to the dealer for its 1000-mile service. This break-in oil change isn't standard fare for all GM cars, and the normal service interval is 7500 miles. The first two services (in addition to the 1000-mile job on the Corvette) are covered as part of GM's new-car warranty. Break-in miles completed, the Grand Sport in its initial testing achieved a zero-to-60-mph time of 3.9 seconds and hit 100 mph in 9.0 seconds, tripping the quarter-mile tape in 12.3 seconds at 116 mph. It also posted a 139-foot stop from 70 mph and pulled 1.11 g's on the skidpad. The $73K as-tested price is a bargain for this kind of amusement-park ride. Combine it with the chassis capability, and it is the best bang for the buck out there. "It's equal parts frustrating and joyous to drive because of its awesome capabilities and the limited number of opportunities to use them," said Buyer's Guide senior editor Rich Ceppos. He couldn't be more right. Shortly after its first trip to the test track, however, the Grand Sport showed signs of an ailment that would dog us throughout our time with the car. At just under 6500 miles we discovered that three of its wheels were bent. Two were repaired, but one was cracked and had to be replaced. In all, that was an $1119 trip to the Corvette cobbler, none of which was covered by warranty. The wheels and tires would hold up for the most part of the next 20,000 miles, over which the Corvette spent most of its time in southeast Michigan, although it did travel to Michigan's lovely Upper Peninsula, Virginia International Raceway, and eastern Pennsylvania. Two more trips to the dealer for oil changes and inspections at 7500 and 15,000 miles were covered. At the 22,500-mile service, along with the standard lube swap, GM calls for replacing the cabin air filter, which made our first out-of-pocket service a $218 afternoon. Not too bad considering the LT1 engine's dry sump takes nearly 10 quarts of oil. Then, while on its first of two trips to Florida, and while wearing Michelin Pilot Alpin PA4 winter tires, the left-front wheel and tire were destroyed by a rather large and unavoidable pothole. A new wheel and tire weren't the easiest to source and cost us $1612 before we could get the Corvette back on I-75 and heading north. The C7's lack of a spare tire (as is typical among high-performance cars) is a serious concern when it comes to road-tripping. Within a month of the Corvette's Florida spring break, while at the dealer for the 30,000-mile service, we had Mr. Goodwrench diagnose a vibration at highway speed and a squeaky rear hatch. The dealer informed us that-surprise!-both right-side wheels were bent. The front was repairable ($145), but the rear wasn't; a replacement cost $641. The 30K-mile service itself ran a very reasonable $138. The squeaking turned out to be just a dirty rear hatch seal, which a technician corrected by adjusting and lubricating it. That was the end of our wheel troubles . . . for about 4000 miles, by which point all four wheels were bent. All. Four. So we shoveled out another $580 to our new best friend, the wheel-repair guy. That, finally, was our last instance of bent wheels on the Grand Sport. In all, we spent $4098 on wheel repair and replacement-seven repairs and three replacements, for an average failure rate of once every 4000 miles. Outside of tire-and-wheel damage, we also picked up a stone chip in the windshield and a crack that propagated from the impact crater. A local shop replaced the glass for $978, bringing the total damage for this long-termer to $5076. The service total, however, was a very reasonable $526. Even with all the Vette's bent wheels, staffers saw it for the all-around sports car that it is. Many felt it has a more refined chassis tune than some cars costing more than twice as much. Others just loved the tire-roasting power. And everyone emoted poetically about the small-block V-8; 460 horsepower goes a long way in the fun category. One lesser-known aspect that came in for praise: the completely dimmable instrument panel and infotainment display, which is a boon to night driving, much the way Saab's Night Panel assisted the eyes' ability to adjust to the darkness. Associate editor Annie White, though, did complain about back pain after a 1000-plus mile trip and noted that the lack of four-way-adjustable lumbar support is a serious miss at this price point. Others, however, lauded the seats, which are the standard units. Our previous long-term Stingray was fitted with the optional competition seats, and we found that their larger side bolsters, while better at keeping buns in place, do not make for the most comfortable everyday machine. Plus, the competition seats feel as if they sit a little higher, reducing the sensation of hugging the road. Other interior gripes included the pervasive and pungent epoxy smell that fills the Corvette's cabin. Many of us also were perplexed as to which electronics supplier is still producing such heinously low-resolution cameras; the images produced by the rear-view unit as well as the two front-view cameras that are part of the 2LT trim package-and helpful for keeping an eye on that low-hanging front splitter-look decades out of date. Retested with 40,000 miles on the clock, the Grand Sport was quicker to 100 mph and 140 mph, and it produced an identical quarter-mile time while going just a bit faster. It was also quicker in the rolling-start and top-gear acceleration tests, leading us to the conclusion that the LT1 picked up a few horses along the road to 40K. Lateral grip was the same as when new, but braking distance grew by five feet. The worn, but not completely spent, Michelin Pilot Super Sport tires didn't have the same longitudinal grip and the launch suffered, hence a zero-to-60-mph time that grew by a tenth. The shifter had developed a little notchiness not present when new, particularly in the fifth-gear gate-multiple drivers complained they couldn't easily find fifth gear when driving on the road, let alone during an on-track redline upshift at 145 mph or so. If the fourth-to-fifth shift were smoother, the Grand Sport would've been quicker to 150 mph, too. Despite the bent wheels, the Grand Sport made a 180-degree turn from the 2014 long-termer with regard to reliability. It suffered not a single unscheduled stop, failure to crank, or Uber request required to bail us out. We didn't even have to add a single quart of oil. It was a sterling test of reliability-and, evidently, our proficiency at finding potholes. 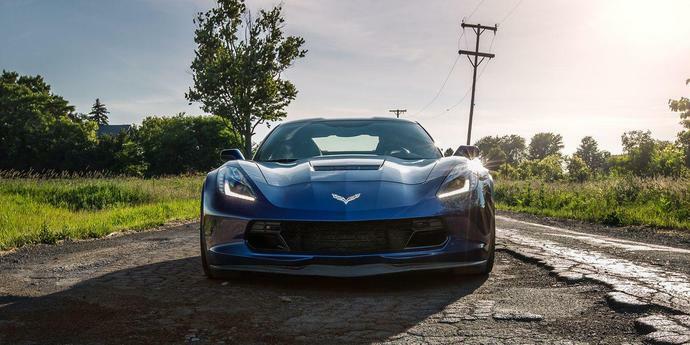 Getting better with age might be the C7's mantra. This generation started with the subtly sweet Stingray, dropped the hammer with the Z06, then polished that offering with the Grand Sport, before unleashing the roaring 755-hp ZR1. And our respect only grew during this second chance at living with a Corvette. Nevertheless, its mid-engine replacement C8 can't come soon enough.